People who grew up in households with low tolerance for emotion tend to carry particular beliefs about emotions in relationships into their adulthoods. Below is a good, but not exhaustive, sampling of beliefs that I’ve heard many emotionally neglected people say. Please read through these seven beliefs, and put a mental check-mark next to the ones that you feel are true. 1. Sharing your feelings or troubles with others will make them feel burdened. 2. Sharing your feelings or troubles with others will chase them away. 3. If you let other people see how you feel, they will use it against you. 4. Sharing your feelings with others will make you look weak. 5. Letting others see your weaknesses puts you at a disadvantage. 6. It’s best not to fight if you want to have a good relationship. 7. Talking about a problem isn’t helpful. Only action solves a problem. When you grow up receiving consistent direct or indirect messages, no matter how subtle, that you should keep your feelings to yourself (Childhood Emotional Neglect), it is natural to assume that your feelings are burdensome and undesirable to others. But the reality is that feelings and emotions are the glue that binds people together. Sharing feelings or troubles with a friend draws them closer and makes you seem stronger. Fighting out a conflict with someone you care about, when done right, is the best way to get through to the other side of that conflict. And talking about a problem has been proven to help people feel better. Fortunately, not one of the above Seven Beliefs is true. In fact, they are each and every one dead wrong. Subscribing to any one of these false beliefs can set you at a disadvantage in friendships and relationships of all kinds. They will each and every one hold you back from making healthy, solid and meaningful connections with people; whether it be girlfriend, boyfriend, spouse, sibling, family or friend. If you put a mental checkmark next to any one of the Seven Beliefs, it may mean that you were emotionally neglected, in some way, in childhood. If that is the case, it will be vital for you to figure out how you were emotionally neglected so that you can overcome it. 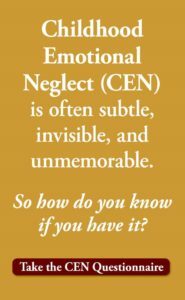 Read more about Emotional Neglect: what it is, how it works, how it affects people and how to overcome it throughout this website. Much more information on Emotional Neglect can be found in my book, Running on Empty: Overcome Your Childhood Emotional Neglect, at Amazon, or your local bookstore. The Kindle version is also available Here. If you feel you need more help in dealing with this, I hope you will contact a qualified psychologist or psychotherapist to help you attack your false beliefs. If you don’t they may hold you back in every area of your life, but especially in your relationships with the people you care about the most. Sappy, Sloppy Emotions: What’s the Point? Sappy, Sloppy Emotion: What’s the Point? Stupid, sappy, mushy, melodramatic, insipid, tiresome, wimpy, lame. These are all words that I have heard people use to describe their own emotions. As a psychologist, I see in our society a poor tolerance for something that is a deeply personal, biological part of who we are as humans: our emotions. Indeed, if you grew up in one of the many, many households where emotion was discouraged or poorly tolerated (Childhood Emotional Neglect), you may now, as an adult, have a negative connotation to feelings of all kinds. You may see emotion as a sign of weakness. You may hide your feelings from yourself and others; even the people you care about the most. You may regard the expression or sharing of feelings as maudlin, illogical, or just plain useless. You may have no idea what you feel or why because you have buried your emotions so deeply, even from yourself. Why did emotion evolve in the first place? Sometimes, especially to emotionally neglected people, emotions feel like a burden. Wouldn’t it be better if we didn’t have to feel sad when we had a conflict with a friend, angry when someone cuts us off in traffic, or anxious before a job interview? On the surface, maybe it would seem easier if we didn’t have to feel those things. But my belief is that if we didn’t have emotions, life would not be better. In fact, it would not be sustainable. You get the idea. For every emotion, there is a purpose. Emotions are incredibly useful tools to help us adapt, survive and thrive. People who were emotionally neglected were trained to try to erase, deny, push underground, and in some cases, be ashamed of, this invaluable built-in feedback system. Because they are not listening to their emotions, they are operating at a disadvantage from the rest of us. Pushing away this vital source of information makes you vulnerable and potentially less productive. It also makes it harder to experience life to its fullest. Emotions do more, though, than drive us to do things. They also feed the human connections that give life the depth and richness that make it worthwhile. It is this depth and richness which I believe provides the best answer to the question, “What is the meaning of life?” Emotional connections to others help us stave off feelings of emptiness as well as existential angst. If you have spent a lifetime trying to deny your natural, biological emotional responses, you may at times feel disconnected, empty, or unfulfilled in life. The people who love you may find you distant, self-contained, or even arrogant. You may find yourself irritable or angry more often than you would like. If any of this rings a bell to you, please read more about Emotional Neglect throughout this website. There is much more information about it in my newly released book, Running on Empty: Overcome Your Childhood Emotional Neglect. In the book, I talk about the many forms that Emotional Neglect can take, the 12 types of parents who unwittingly emotionally neglect their child, and the 10 issues that emotionally neglected children struggle with as adults. I also offer six clear strategies for overcoming Emotional Neglect. Running on Empty can be ordered HERE from Amazon.com. It’s also available at your local bookstore. Are you wondering if Emotional Neglect applies to you? Take this questionnaire to find out. Circle the questions to which your answer is YES. Look back over your circled (YES) answers. These answers give you a window into the areas in which you may have experienced Emotional Neglect as a child. To learn more about Emotional Neglect, you can order a copy of my book, Running on Empty: Overcome Your Childhood Emotional Neglect by clicking on THE BOOK tab of this website, or by going to Amazon.com or your local bookstore.